Koi fish are also known as the common carp (Cyprinus Carpio). Nobody knows exactly where today’s Koi originated from but a common belief is that they originated somewhere near Persia and western Asia. It is believed that the comm on carp migrated into China either through trade or natural waterways. It is not known exactly how the carp was introduced into Japan, but it is believed to have been through trade. The carp was found to be an excellent source of protein. Rice farmers in the Niigata Prefecture started harvesting carp that were six or more inches long for the long winter months. Once they were caught, the rice farmers would salt their catch to withhold the long, cold winter months. Around the mid-1800's, rice farmers started noticing mutations on the carp. Some of these mutations consisted of blotches of red and white on their scales. After separating the mutated carp from the rest of the school, the farmers decided to try to breed these mutated fish in hopes of creating new distinct patterns and colors. These rice farmers were ahead of their time when selectively breeding these carp. 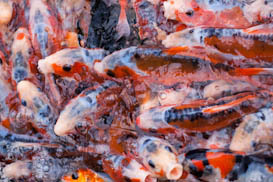 Koi breeding became very popular through out the years. In 1914, some koi breeders took some of their prized koi to an exposition in Tokyo. Spectators from all over Japan came to Tokyo to view these “living jewels”. 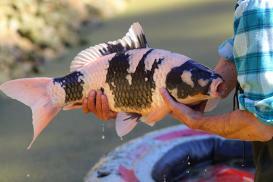 Through out time breeders began noticing many new and different varieties of the koi breed. As time passed, koi enthusiasts could be found all over the world. Many people have tried to breed koi on their own, but nothing can compare to the fish found in Japan.